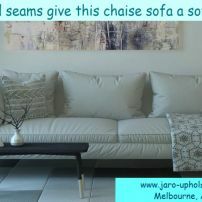 commented on "Chaise Sofa with Gathered Seams for a Soft Look." Chaise Sofa with Gathered Seams for a Soft Look. Want something different. Why not a custom made chaise or sofa with gathered seams. Select from a large range of fabrics. Feel free to Email us for a quote.